It's that time of year when we all start thinking about and planning what to buy for Christmas, including stocking fillers and of course who could forget the all important Secret Santa Gifts. 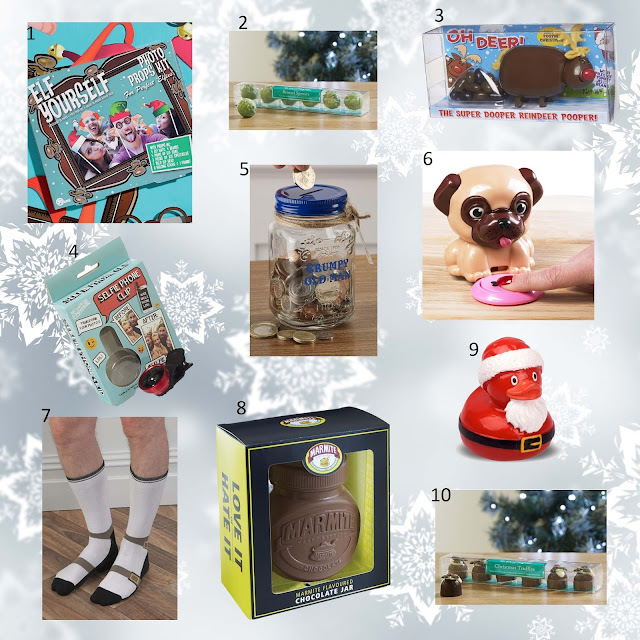 Here are some of our favourite gift ideas, so whether you're just looking for stocking fillers, secret santa gifts or something else, you're sure to find something you find fun below :-), and what's fab about our gift ideas are that they are all priced under £5! Elf Yourself Photo Booth - what better way to have your photo taken we say! Chocolate Brussel Sprouts - great for those who won't even have them on their plate at Christmas Lunch. Selfie Phone Clip - we all know someone who loves taking a selfie, make them happy this Christmas with this great little gadget! Grumpy Old Man Fine Jar - help your grumpiest family member, friend or work colleague save money with their grumpiness by paying money into the jar each time they're grumpy - we like this one a lot! Percy Pug Nail Dryer - aww he's so cute and really wants to help dry your nails! Sandal Socks - know someone who loves wearing socks with sandals - this is essentially 2 gifts in one - lol! Marmite Flavoured Chocolate Jar - quite simply you're going to love it or hate it! Festive Duck Lip Balm - how cute! he's adorable! Chocolate Christmas Puddings - yummm-mmy!